It was gorgeous in Paris yesterday. We ventured to Sacre Coeur. The crowds were overwhelming so we just walked around the outside. My son hadn't been here so I thought he should see it before he leaves. There is a textile/fabric district at the base of Sacre Coeur. We cut through a few of the streets to get back to the metro. It made my son extremely anxious as I teased him about stopping in the stores. The child of a sewer has a fear of fabric stores! 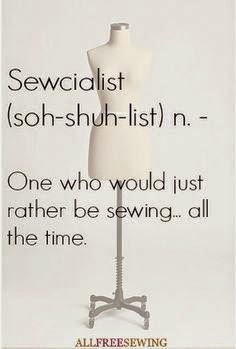 But lucky for him...I have already scoped it out and there are no quilting batiks to be found in this area. Another adorable Santa ornament stitched up. This one is Yukon Santa. My husband thinks that's a reindeer with Santa. I'm sure it's a pack mule! And another Bowling Santa ornament is finished....Santa's bowling shirt. 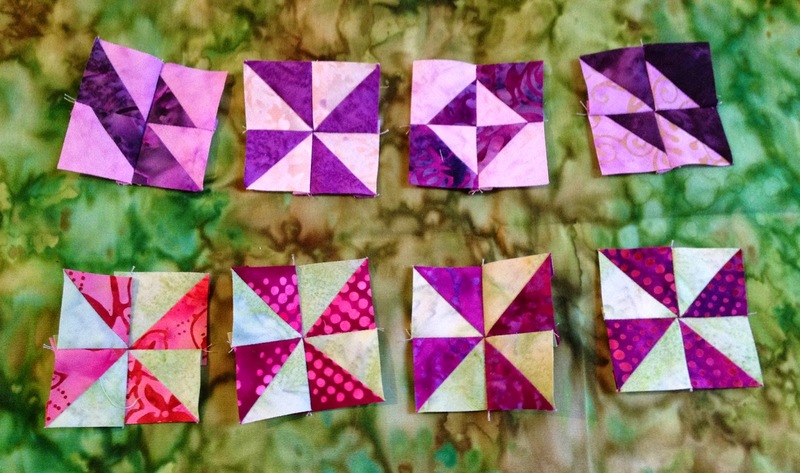 It must be that time of year when new BOMs are starting at quilt shops and on the internet. Might have to spend some time investigating the internet options. Playing with scrap HSTs. It makes me feel so frugal. We've been having several little adventures the past few days. Christmas day was gorgeous so we got a little walk in before dinner. The day after Christmas it was the men's turn to pick our daily activity...no surprise it was to seek out a Canadian pub. We actually went to two and both were closed. Wound up at an Irish pub right off the Seine on the edge of the Latin Quarter. My son and I walked home from there and once again I made him stop while I took pictures of interesting iron work. These are a a series of five iron reliefs along a wall. On Saturday we went to a memorial for American volunteer pilots who flew for the French military squadron, L'Escadrille Lafayette, in World War I. Underneath the monument is a crypt with 68 sarcophagi for the remains of those American pilots killed in conflict. This site is not one that is covered by US taxpayer dollars for its upkeep like the US cemetery in Normandy. There is a US foundation that works constantly to raise money for care of the site. It is really a lovely memorial with lots of wonderful details but in sore need of some TLC. This beautiful mosaic is on the floor under the central arch. I'm guessing this was the American pilot's unit insignia...definitely an iconic American image. Sunday's outing was also related to aviation though mostly it was naval history. We visited the wing of the Trocadero that houses a French maritime museum. It had a few life-sized replicas but was full models made to scale at the museum. There was a tiny replica of Christopher Columbus' Santa Maria. I especially liked the world map on display with this era...no Alaska discovered by Western civilization and California is a separate piece of land! You have the best view of the Eiffel Tower from the Trocadero...though the weather was very blustery and you have to share the view with thousands! We ended that day with lunch at an English microbrewery based in France, "Frog." Amazingly enough...their menu of bar food was all about American barbeque. Hubby and I shared this platter for two. It wasn't Texas quality...but it was tasty. The mostly shredded carrot jar was cole slaw...it had very little taste. Next to it is a jar of fried okra and fried red pepper strips. I don't eat okra but I loved the pepper strips. Then some sweet potato fries and baked beans...liked both of those. Two shredded beef sliders, fried chicken wings and pork babyback ribs...and Texas toast. I've been spending a lot of time playing in EQ7...and I did some damage to my credit card on a batik sale at Fabric Fanatics. They always have a big, end-of-year sale. Hubby is going back to Alaska soon for about a week and can bring me back my order. It will be Christmas all over again in a few weeks! Hope you all had a wonderful Christmas. We did! I am looking forward to 2015. Internet issues kept me from blogging yesterday but we did venture out to a Parisian Mall, Beaugrenelle. It is the low structure in the foreground with a connecting walkway across the street. As you can see there are high-rise buildings creeping up on us...getting on the outskirts of "old Paris." I was standing on a bridge crossing the Seine when I took the first three photos on today's post. We were still within walking distance of the Eiffel Tower. See the mini Statue of Liberty? The little electric car on the street is one you can rent...right off the street! From inside the mall at Chipotle's Mexican Grill. I got the huge whole wheat burrito filled with rice, black beans, grilled peppers and onions, shredded beef, pico de gallo, green salsa and guacamole. It was delicious...I'm going back...soon. We took the metro to the mall and then walked back to the apartment. I do like that part of city life...walking after I eat. 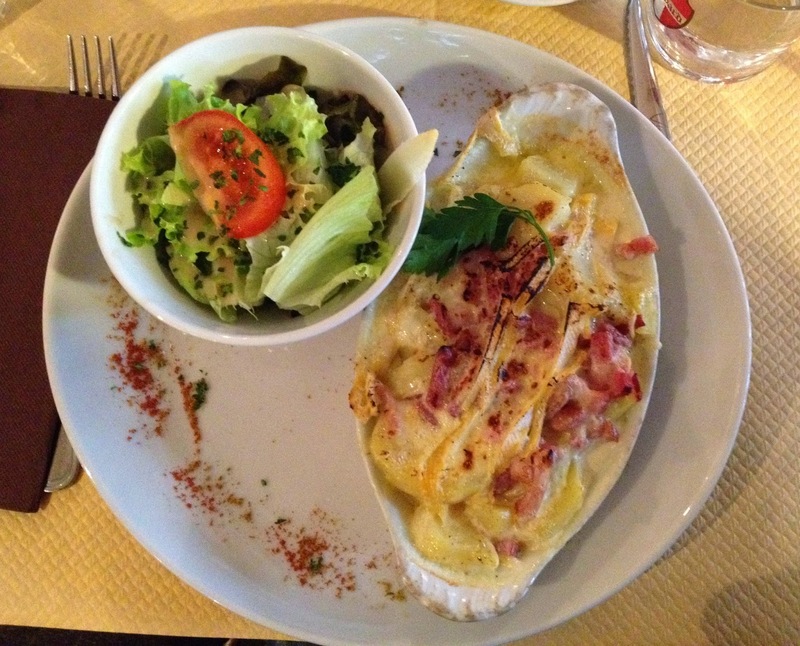 specializing in traditional tartiflettes...kind of like an au gratin potato dish with ham. 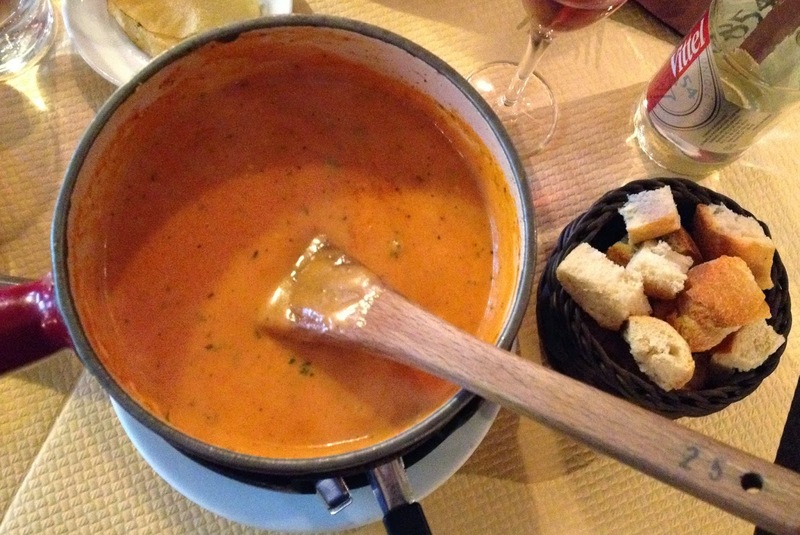 fondues...mine had fresh herbs and tomatoes in it. and raclettes...or table top cooking. 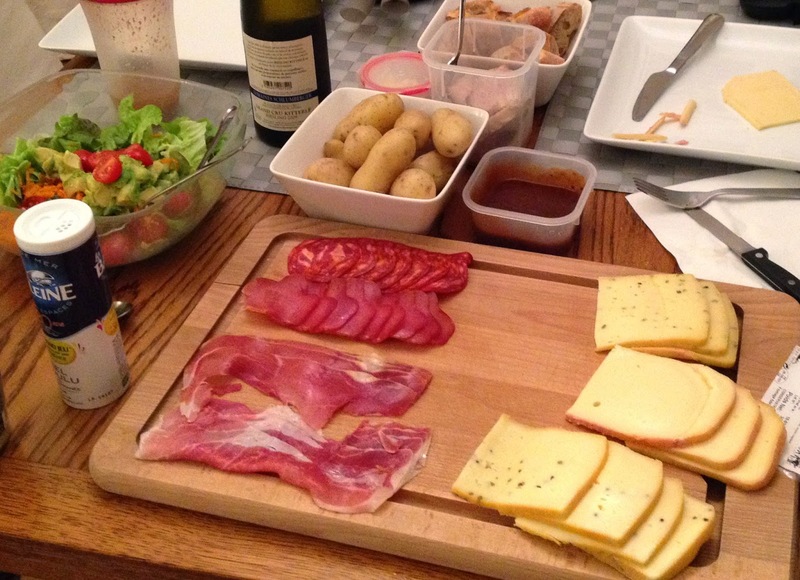 This tray of meats and cheeses was accompanied by a tabletop broiler and a bowl of steaming hot boiled potatoes. You melt the cheese in cute little pans, pour the cheese over a bit of mashed potato. 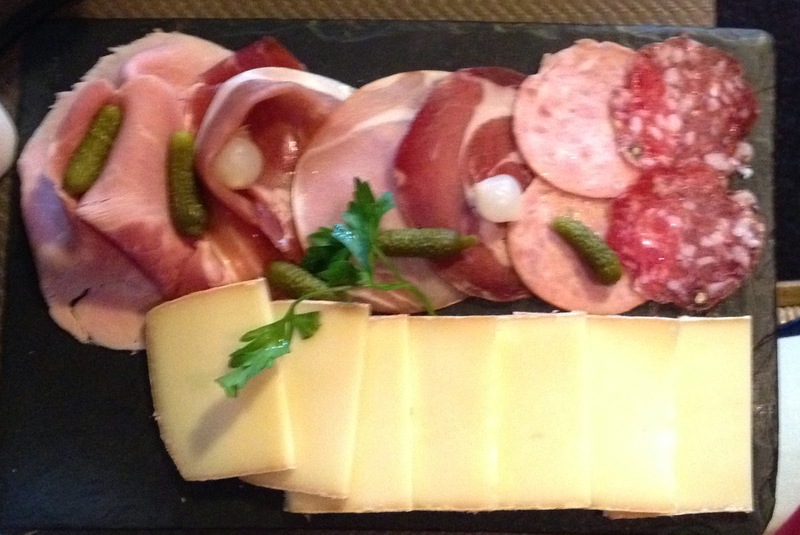 Meats on the side to enhance your dining experience. It makes me feel very much like I should pull out some bell-bottomed jeans and psychedelic shirts. I loved it because it was all about the cheese! 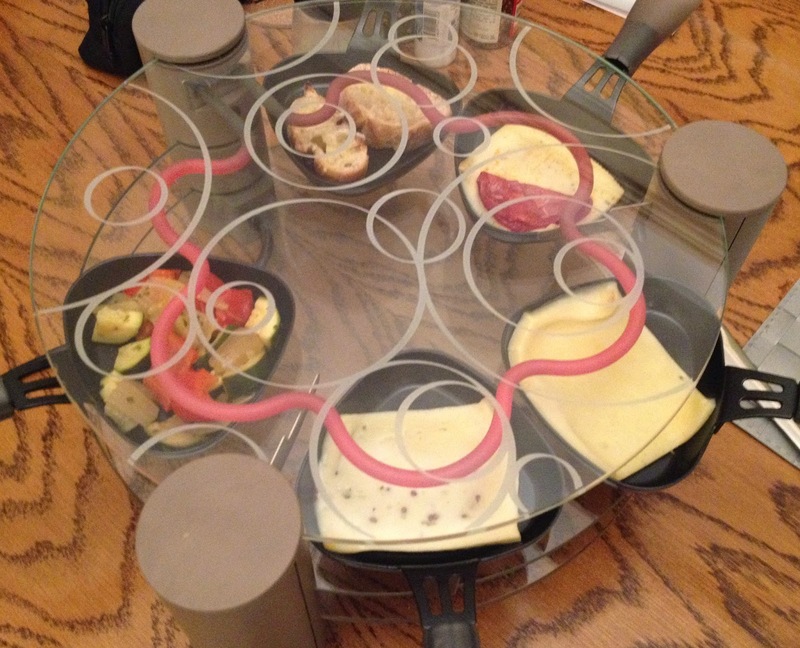 It so happened that Christelle's daughter had a raclette I could borrow...so I did! You can buy all the cheeses prepackaged for raclettes. I also picked a prepacked selections of hams from Spain. The only prep was boiling the potatoes. Our borrowed electric broiler...I also added some leftover sauteed veggies and slices of bread with garlic butter. Yum! In minutes we had good eats. 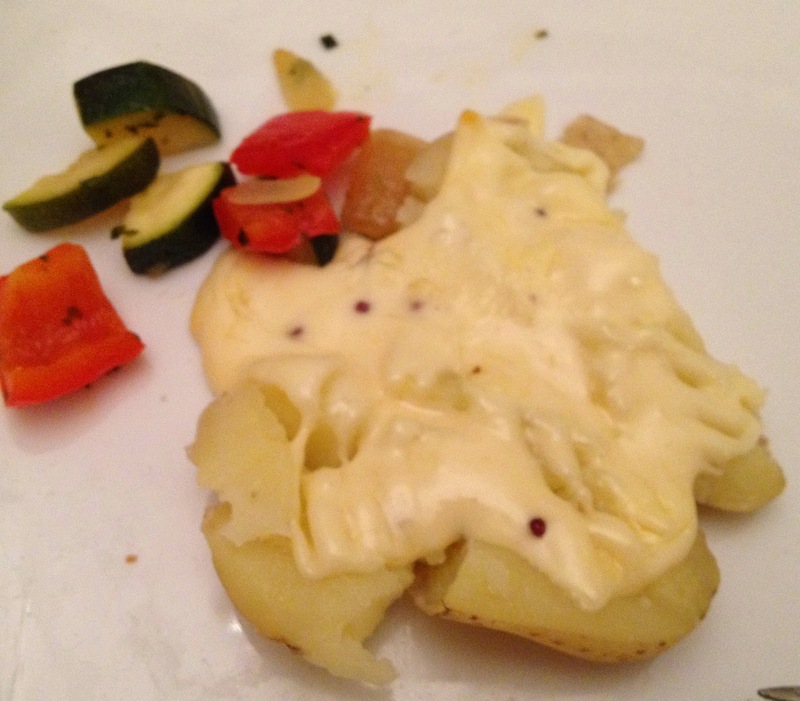 One of may favorite meals is stuffed baked potato and salad...I would call this a great Swiss version of that meal. I just might have to get me one of these little tabletop broilers. I loved this idea...a stand of birch trees. This would look great in front of my Alaska house. We then meandered our way to the Hard Rock Cafe. We were in search of the Paris T-shirt and American food. I had a very American style Chicken Cesar Salad, My son had BBQ ribs. It hit the spot. It wasn't Texas BBQ but it will do in a pinch. Along the way we passed a very official French building with fancy guards. Turns out it was the French President's home, the Palais de l'Elysees. I couldn't get a photo but there was a huge, gorgeous Christmas tree in a courtyard area. Interesting ironwork on a large bank building. I'm pretty sure my son thought I was crazy to make him stop so I could take this picture. Got the beards done on the Northwoods Santa Series. the pattern called for glued on beards but I like to stitch them in place. Here's the designer's beards. I got pretty darn close to her conception. Another outing planned for tomorrow...Mexican food. Strange for a Paris outing but I'm a bit tired of Duck Confit. Trying to entertain a 20-year-old man who has been to Paris twice already...working around food seems to make him happy. We do lots of walking! 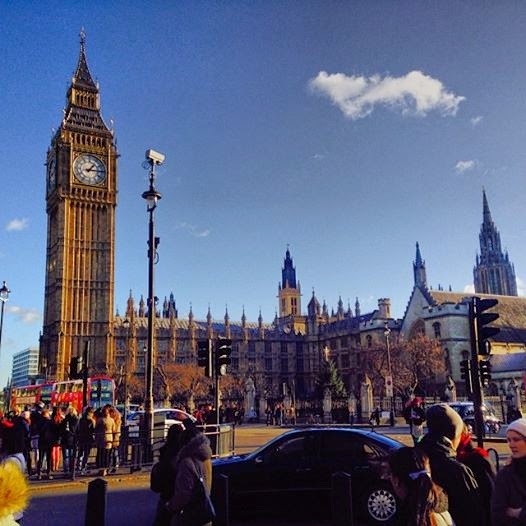 More great weather on my recent trip to London! We did the Tower of London, HMS Belfast, Borough Market, West End theater performance, Winston Churchill War Rooms, walked across the Millennium bridge, hung out at Trafalgar Square and shopped in the Leicester Square area and visited the Natural History Museum. All of that in just two nights and three days. Almost as soon as my son arrived in Paris, we boarded a train for London. He wanted to see, "The Book of Mormon," and with the holidays upon us we just squeezed it in. I accomplished my goal...find adorable Christmas ornaments. We had two hours to kill before our train left on Saturday afternoon so we hiked off toward Buckingham Palace. Seems the British have their own version of the Arc de Triomphe, the Wellington Arch, which celebrates the Duke of Wellington's victory in the Napoleonic War. The Palace itself wasn't too pretty...I think it needed some holiday cheer. Across from the palace is this memorial to Queen Victoria. The train ride to and from London is always a good time to catch up on some cross stitch. I did finish another Bucilla bowling ornament before we left for London. It is rather difficult to top the first three days of my son's visit with us. I suppose we could use a quiet day or two to come up with an itinerary for Paris. Time to break out the Christmas music! I might get used to this two-hour decorating scheme instead of the two weeks I can spend in Alaska. Of course that also includes doing the outside of the house...no need for outside decorations when living in an apartment. And it is soooo dark in Alaska...my decorations stay up past New Year's. I miss it!!! I had my final French visa renewal appointment for the year. Today's appointment was remarkably quick...but only because I was accompanied by a French speaking assistant, who is an American...and who didn't take "No" for an answer. Tomorrow I will be cleaning the apartment for my son's arrival. There is a taxi strike going on throughout Paris right now which will impact picking up our son from his flight coming into Charles Degaulle Airport. The taxis block highway lanes...all but one....which grinds traffic to a crawl. I will have to meet him at the airport and navigate the train system and metro system with his big suitcase. A major pain since lots of stairways are involved...very few...if any elevators. Sometimes there are escalators but only going up...and very few of those! It irritates me so much. Not what I want my son to have to navigate after traveling for almost 24 hours. Time to get back into the holiday spirit. Wilderness Santa...just waiting for his beard and mustache. One more pattern to make to complete the Northwoods Santa set. The last ornament for the Bucilla kit, Cupcake Angel. She was a lot of work! I'm just planning to work on Bucilla ornaments and cross stitch Santas for the next few weeks. 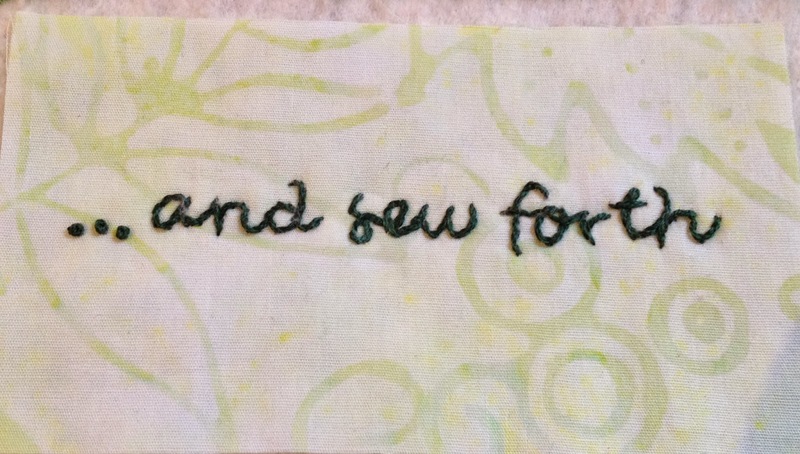 One of my sons will be arriving on Wednesday so it's not the time to start a quilting project. Though I suppose I could pull out a UFO to work on now and then.